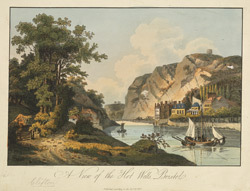 A view of the Hotwells near Bristol in the late 18th century, showing the rocky gorge from which the hot spring sprang, the buildings along the side of the River Avon and traffic on the River. Daniel Defoe visited here in the early 18th century and commented 'The Hot Well, or, the water of St Vincent's Rock, is not in the city, but at a conference of two little rivers, and on the north side of the stream. It is but a few years since this spring lay open at the foot of the rock'. He explains that the rock had been worked down to lay the foundations for a building with 'good apartments for entertaining diseased persons'. He described 'the water of this well possess'd its medicinal quality....it is now famous for being a specifick in that otherwise incurable disease diabetes'.